In this screen you just have to define the name of your EtlTool. This name is also the name of the postgreSQL table or MySQL table where data lines are stored. A file called "EtlTool.bat" will be created into the datasource folder. 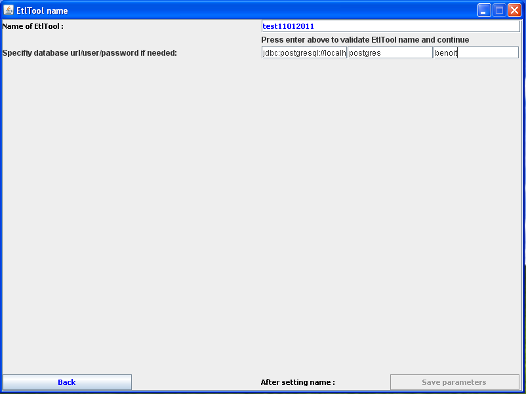 You must press enter to validate your EtlTool name, and then you can save your parameters. Since Benetl 3.6 you can define a specific database (installed on another system). You can enter here: the url of your MySQL / postgreSQL installation, your MySQL / postgreSQL user and its password. This can be edited in your "benetl_my.xml" or "benetl_pg.xml" configuration file.